The luscious, silky panna cotta is my go-to dessert for summer picnics and potlucks. Panna cotta is one of those crazy easy-to-make desserts that only looks impossible. 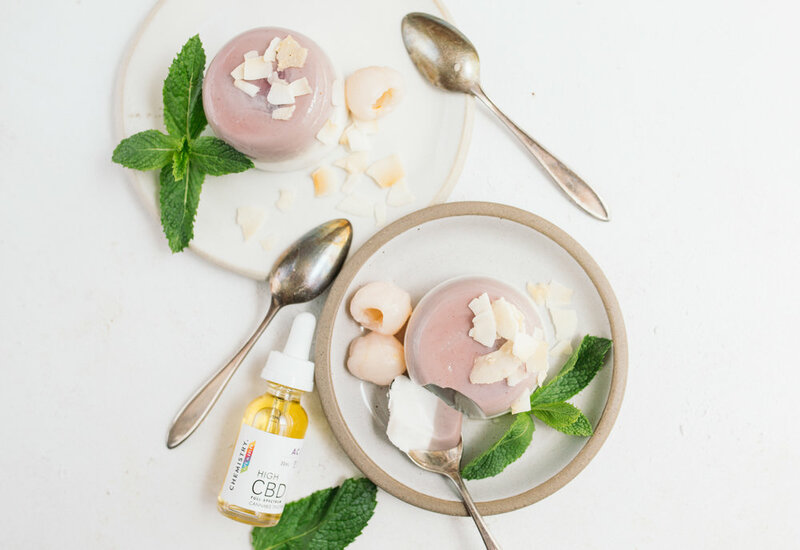 In Italy, it’s traditionally made with heavy cream but this dairy-free version uses coconut cream and Chemistry High CBD Full-Spectrum Cannabis Tincture for a mellow after-dinner treat. 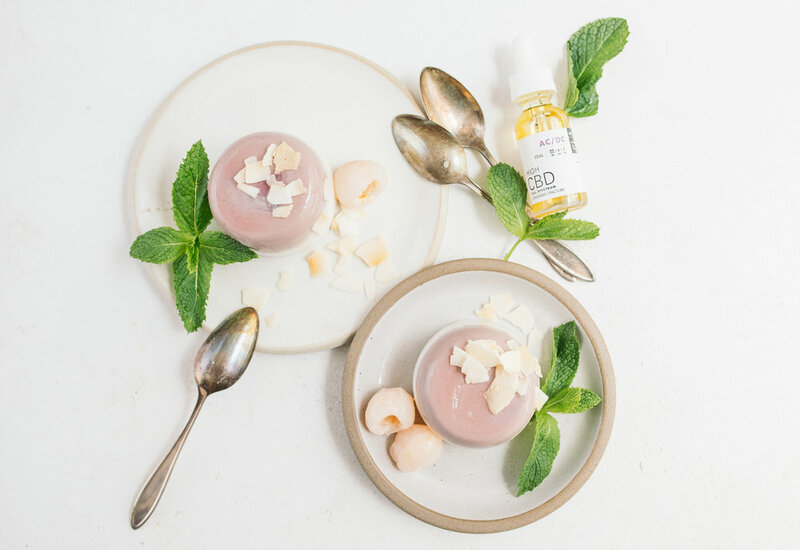 The coconut milk is gently heated through before the tincture is added and set in a mold with gelatin. It can be made days in advance and kept in the refrigerator until you’re ready to serve. Dosage: Chemistry High CBD Full-Spectrum Cannabis Tincture (AC/DC) contains 10.5mg per dropper. Use more or less depending on your personal tolerance. Start with one portion of a serving and wait up to two hours before you make an informed decision on whether to consume more. Always dose carefully and listen to your body, and never drive under the influence of cannabis. 1. Lightly coat 6 ramekins or stemless wine glasses with coconut oil. 2. Bloom 2 tsp gelatin in 2 Tbsp water for 5 minutes. 3. In a small saucepan over medium heat, add remaining coconut milk, coconut cream, and ¼ cup of lychee syrup from the can. Bring to a slow simmer before removing from heat to add vanilla extract and salt. Whisk until combined. 4. Remove 3 cups of the mixture and add 6 droppers of Chemistry High CBD. Whisk until uniform. Set aside in the fridge for later use. 5. Add the bloomed gelatin into the saucepan along with cherry juice and mix well. 6. Pour evenly into prepared ramekins or glassware and add a few pieces of lychee. Refrigerate until lightly set, about 2 hours. 1. After two hours, empty additional package of gelatin into a bowl with ¼ cup of the reserved coconut milk mixture. Stir until uniform and set aside to bloom for 5 minutes. 2. In a small saucepan, bring the rest of the coconut milk mixture to a slow simmer before removing from heat. Add the bloomed gelatin into the saucepan and whisk until uniform. 3. Gently pour into prepared ramekins or glassware on top of the pink layer. Refrigerate until firmly set, about 4 hours or overnight. To serve with ramekins: Invert the ramekin onto serving plates. The room temperature should help release the panna cotta from the mold. You can speed up the process by dunking the molds in warm water before inverting. Garnish and serve. To serve in wine glasses: Add garnish and serve as is. To garnish: Top with crunchy coconut chips and mint leaves. Add an optional drizzle of honey for an extra touch of sweetness!